The article discusses the conditions under which can we say that people enter the economic system voluntarily. 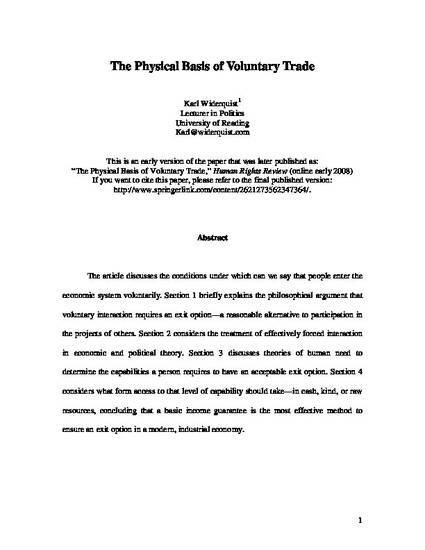 “The Need for an Exit Option” briefly explains the philosophical argument that voluntary interaction requires an exit option—a reasonable alternative to participation in the projects of others. “The Treatment of Effective Forced Labor in Economic and Political Theory” considers the treatment of effectively forced interaction in economic and political theory. “Human Need” discusses theories of human need to determine the capabilities a person requires to have an acceptable exit option. “Capability in Cash, Kind, or Raw Resources” considers what form access to that level of capability should take—in cash, kind, or raw resources, concluding that a basic income guarantee is the most effective method to ensure an exit option in a modern, industrial economy.